The NCAA has proposed a new rule that would prevent the offense from snapping the ball for the first 10 seconds of the play clock. With offenses running more plays than ever before, the NCAA Football Rules Committee believes giving defensive players time to substitute would improve player safety. If the offense snaps the ball before the 10 seconds they receive a five-yard delay-of-game penalty. The rule would not be in effect the last two minutes of each half. Some head coaches have voiced their opinions. Oklahoma State coach Mike Gundy expressed his opinion February 13th on twitter, “The no huddle, fast tempo style has changed the game of CFB. Our sport has exploded in popularity with high scoring games & packed stadiums.” A relevant point when college football attendance is on the decline. A recent article on ESPN.com by Darren Rovell reported “attendance for FBS schools dropping below 46,000 per game for the past five seasons.” (http://espn.go.com/college-football/story/_/id/10458047/next-generation-ticket-holder-concern-students-show-college-football-games). These fast offenses are fun to watch but this rule change could hurt the already dropping attendance numbers. Alabama’s only losses in the regular season came against Texas A&M and Auburn, two of the country’s best up-tempo offenses. Oklahoma also used some no-huddle offense to their advantage in their 45-31 defeat of the Tide in the Sugar Bowl. The no-huddle can clearly work against Alabama. Many people, myself included, think Saban wants this rule change so his defenses can continue dominate. 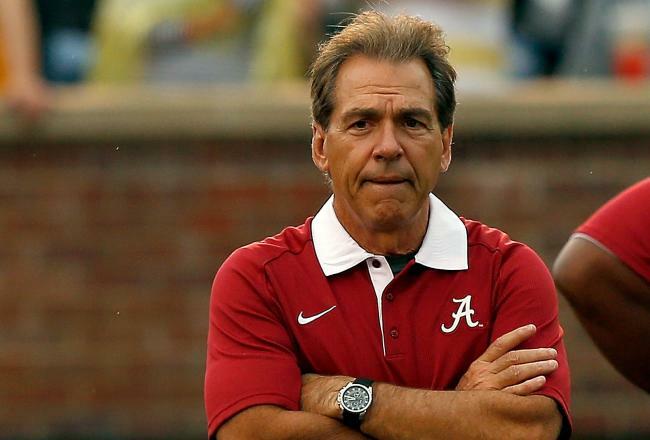 Some Saban-style teams, however, have managed success in stopping face paced offenses. Stanford, a team known for its slow, ground-and-pound offense held Oregon and UCLA to 20 and 10 points respectively. They also beat Arizona State twice, another team with a solid no-huddle attack. Michigan State, for example, held Ohio State’s fast paced offense to its lowest point total of the season in the Big 10 Championship Game. Auburn head coach Gus Malzahn has been outspoken against the rule change, stating in a press conference,“there’s absolutely zero evidence, documented evidence, that is hazardous on the pace of play, only opinions.” He also pointed out the rule change would make it more difficult for a team to come back late in the game. A website cfbmatrix.com has been putting together data on pace of play and its effect on injuries. His data reflected the Big 12 conference ran the most plays of the five BCS conferences between 2009-12 and had the fewest “starts lost to injury” of the five conferences. Alabama lost 30 starts to injury from 2010-12 despite being in the bottom 10 of plays run per game. Compare that with Oregon which lost only 18 starts between 2009-10. The most glaring stat of all though was in 2012, the top 15 teams in plays-per-game had eight less “starts lost to injury” than the 15 slowest teams. To become official, this rule will have to pass the NCAA Playing Rules Oversight Panel on March 6. Hopefully the panel makes their decision based on the evidence.